The most exciting mixture of colours in years! Imagine filling your summer beds and borders, as well as patio pots with vibrant colour. Masses of huge, conical-shaped blooms from June until October, with some clusters reaching over 30cm (12in) across. The collection covers the widest colour range and each is very easy to grow. Totally winter hardy and guaranteed to thrive anywhere in the UK! Great cut flowers too! Height 90 cm (3ft). 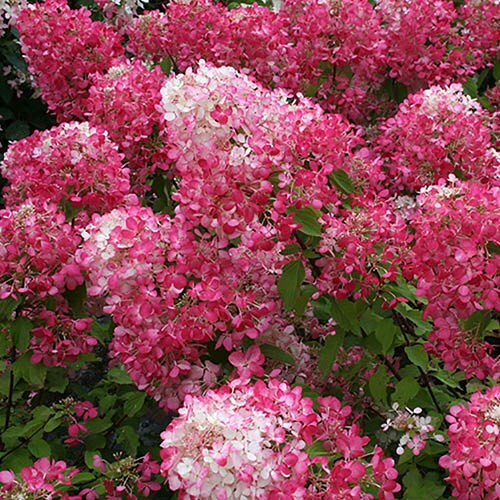 Supplied as 3 x 1.3L established plants, 1 each of Diamant Rouge, Limelight and Sundae Fraise. Masses of huge, conical blooms from June until October –some clusters over 30 cm (12in) across – that will fill your summer beds, borders and pots with wonderful colour. The collection covers the widest colour range and each is very easy to grow, totally hardy and guaranteed to thrive! 'Diamant Rouge' produces incredible balls of burgundy coloured flowers, which turn white as the season progresses. Standing tall and proud on their stems, each flower cluster can reach up to an amazing 40cm (16) across! 'Limelight' grows strongly each year with lush mid green foliage and pyramid shaped cones of flowers. The buds open in a delicate shade of lime green, maturing to a gleaming white and lasting for weeks and later gaining a lovely pink flush. 'Sundae Fraise' produces strawberry sundae coloured blooms on compact red-brown stems. Depending on the acidity of the soil they are planted in, the colours can vary so why not plant them in different soils for vibrant and varied displays. Grow in fertile, humus-rich, moist but well-drained soil in full sun or partial shade with shelter from cold drying winds. Water regularly and apply a general purpose feed every two weeks during the growing period.